In a few more weeks, my daughter will be heading back to collage for her senior year! These last several years have gone way too fast. I still see her standing in front of her dorm room when we first dropped her off at school feeling absolutely terrified at leaving my baby "alone" yet thrilled for her as she began a new adventure. She has grown into an amazing, strong and self-sufficient (well, mostly) woman and we could not be prouder watching her spread her wings into adulthood. 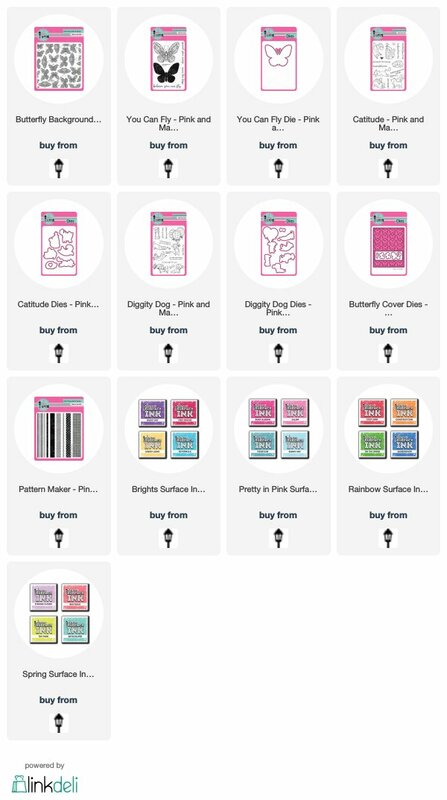 The new You Can Fly stamp set and coordinating die are perfect for creating projects to give for special occasions or to send a bit of encouragement to someone. For my card, I used the Stitched Rounded Rectangle dies to cut different colored cardstock as well as a pattern paper from the Beach Bum 6x6 paper pad. For the butterfly, I inked up the stamp, spritzed with water and then stamped on white cardstock. After the ink dried, I stamped the detailed butterfly image on top and die cut. I made a banner strip and stamped the sentiment. Be sure to check out the entire Pink & Main July release!